Total area: 1180 sq. kms. 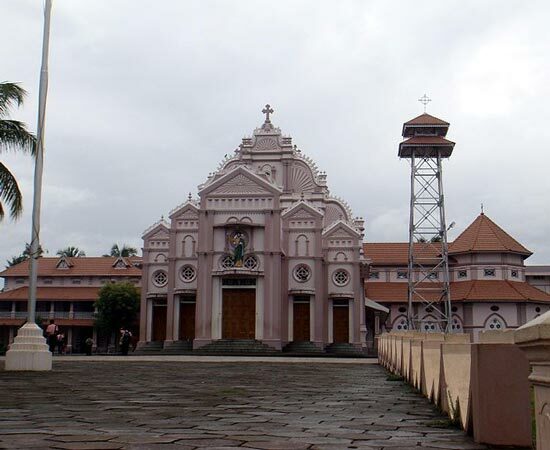 Diocese of the Irinjalakuda is blessed by the footsteps of St. Thomas the Apostle since it contains Kodungallur which is the cradle of Christianity of India. From the ancient times, Kodungallur was an important trade centre. This center had trade relations with the Persians, Greeks and Romans. According to the tradition, St. Thomas, the Apostle, landed at Kodungallur (Malliankara), the capital of the Chera Empire in the year A.D. 52. He preached the Gospel here for the first time and founded churches. The apostolate of St. Thomas was fruitful among the people of Kerala. According to Malabar tradition seven Christian communities were formed in seven different places before he was martyred in A.D. 72 at Mylapore. Thus, the diocese of Irinjalakuda was privileged to receive the Christian faith for the first time in the history of India. The Diocese of Irinjalakuda is surrounded by the Archdioceses of Ernakulam-Angamaly, and Trichur as well as the dioceses of Idukki and Ramanathapuram. The Diocese has made fast strides and as a result, has steadily grown in all spheres. It has at present 56, 958 families with a population of about 2,61,465 Catholics spread over its 10 protopresbyterates : Irinjalakuda, Chalakudy, Ambazhakad, Puthenchira, Edathiruthy, Kuttikad, Mala, Parappukara, Kalparambu and Kodakara. Canonization of St. Euphrasia CMC a native of Edathiruthy Forane was held in Rome on 23rd November 2014. It is also remarkable that Bl. Mariam Thressia (1876-1926), native of Puthenchira and the foundress of the Congregation of Holy Family hails from the Eparchy. Rev. Fr. Joseph Vithayathil was declared Venerable by the Holy See on 14th December 2015. The servants of God Rev. Frs. Antony Thachuparambil, Augustine John Ukken and Canisius Thekkekara CMI also had their birth or ministry in the eparchy. Late Mar James Pazhayattil, the first bishop of diocese of Irinjalakuda was appointed on 10th September 1978 at Irinjalakuda and His Excellency retired from the office on 18th April 2010. On 10th July 2016 His Excellency left this earthly abode to receive the eternal reward. On 13th July 2016 his body was laid to rest at the Sacred Heart chapel of St. Thomas Cathedral, Irinjalakuda. Mar Pauly Kannookadan, the present Bishop, was appointed on 18th January 2010 and was ordained bishop on 18th April 2010 at St. Thomas Cathedral, Irinjalakuda. He was enthroned, the Bishop of the Eparchy of Irinjalakuda on the same day.